Fractional RF micro needling system is helpful in stretch marks, acne scarring & large pores. It treats the target area through rapid penetration of insulated micro needles however it does not cause any extensive damage to the epidermis. After consultation with the dermatologist and assessment of stretch marks it is decided if only MNRF laser will be performed or it may be followed by PRP. 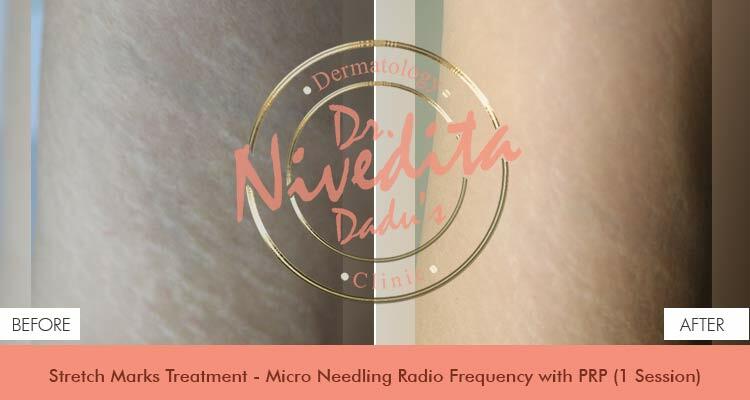 Micro needles facilitates healing growth factors come into action which aids in natural recovery along with a high tension RF pulse is emitted to the target area which degenerates the collagen fibres and promotes construction of new collagen by stimulation of fibro blasts. It is a safe procedure with minimal pain only targets the area below epidermis. It is a an efficient procedure to stimulate fibro blasts and promote production of new collagen.